Uncontrolled crossing point at Institution Road where the new signalised toucan crossing will be placed. A new pedestrian crossing will be installed in Elgin next week. The toucan crossing will replace the existing uncontrolled crossing at Institution Road. As well as the installation of the new traffic signals, works to improve the local cycling links will also be carried out. Work will start on Monday, and will be carried out between 9.30am-3.30pm. It is expected to take four weeks to complete. Construction teams will be at the site for the first weekend of the project, but the remainder of the work will be carried out on weekdays only. 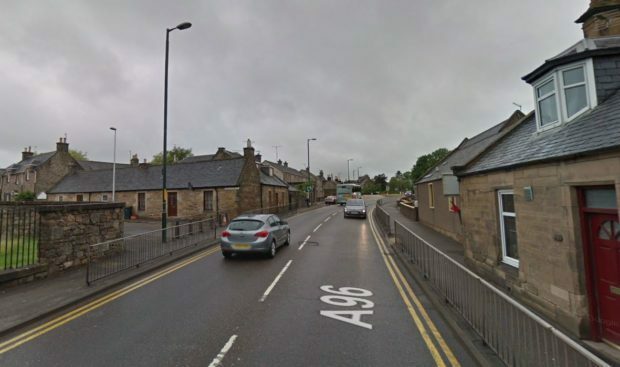 Temporary traffic lights will be in place on the A96 at South College Street during the work, and a temporary footpath diversion will signposted. Andy Thompson, Bear Scotland’s north-east representative, said: “Safety is a top priority for both BEAR Scotland and Transport Scotland and this scheme is part of our commitment to improving pedestrian facilities on the trunk road network. “The new controlled crossing facility in Elgin will allow users to safely cross the A96 and encourage walking and cycling as a mode of transport. The crossing will be of particular benefit to local children as schools are situated close to the location where the crossing shall be installed.